Oregon had something they haven’t had at any time in recent memory this past season; a potent passing game. Since Mark Helfrich has taken over the reigns from Chip Kelly, the Ducks’ passing attack has gotten stronger every season, culminating in the performance we saw last season. This unprecedented aerial proficiency led to the most balanced attack Oregon has had in a while. Moving forward without Marcus Mariota begs the question, “Was the strong passing game a philosophical decision to make the offense more balanced, or simply a side effect of having a great QB such as Mariota? While Lockie is not a statue, he does not have the great ability of Mariota or Adams. If the new focus on the passing game is truly a philosophical change meant to make the offense more balanced then Helfrich is going to need more than just a Darron Thomas-type QB. 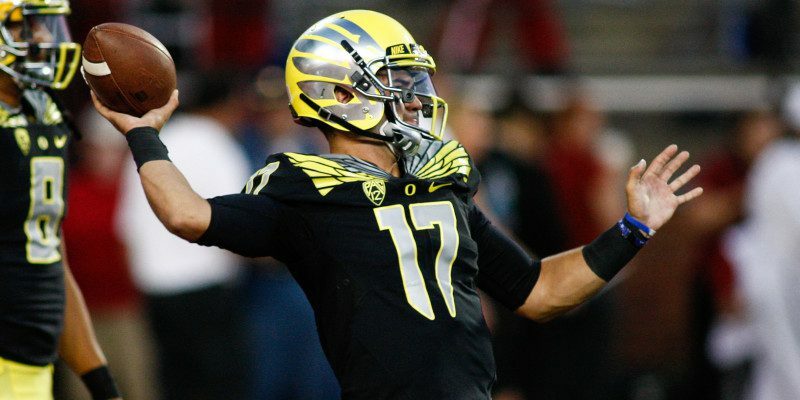 If this is the case then Oregon’s interesting QB competition becomes even more intriguing. Enter Jeff Lockie; Lockie has more experience with the offense than the much talked about Vernon Adams, and by all accounts should be the better passer. Lockie may be the Ducks starting QB next season, putting them in an interesting position, as Lockie is not the kind of athlete that Mariota was, or that Adams is. After sitting in the shadow of Mariota, is it finally time for Lockie to get a shot? If Lockie does win the starting job, then we could see Oregon move toward an offense similar to what Kelly is doing with the Eagles, utilizing more short passes and screens to open up the run game. While the Read Option would still be a large element of the offense, it wouldn’t necessarily be the main element all of the time. This wouldn’t be that big of a change in direction, as the short passing game that Kelly is using in Philly is simply an extension of Oregon’s Bubble Screens and Packaged Plays, making it a natural progression for Helfrich and Co., toward a balanced offense. An offense similar to the modified Spread that Kelly is running in Philadelphia would fit both Lockie and the rest of the offense very well, and would go a long way to achieve the balance that Helfrich seems to want on offense. 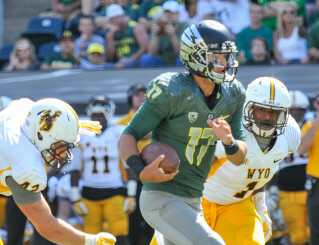 In the end, the schemes that Helfrich puts in place for next season will be determined by who wins the QB competition. Regardless if it’s ultimately Lockie or Adams taking snaps next season, a strong run game will still be the backbone of what should be a very dominant Oregon offense.